If you want to know what pre-workout supplements are, why people use them, and what works best, you want to listen to this podcast. Ten years ago, pre-workout supplements were for the unhinged looking dudes in the gym who nobody made eye contact with. You know the type: steroids, stringers, water jugs, strutting and peacocking, and the like. Back then, the pre-workout space mostly consisted of products like Craze, Jack3d, and Detonate (all of which have been banned, by the way) that contained mega-doses of amphetamine-like stimulants and little else. Fortunately, times have changed, and now we have pre-workout supplements that contain lower levels of much safer stimulants plus clinically effective doses of safe, natural ingredients scientifically proven to enhance performance and muscle and strength gain. That’s why people who take their training seriously aren’t asking whether they should take a pre-workout supplement anymore but instead which they should choose and why. And that’s what Kurtis Frank and I talk about in today’s interview. 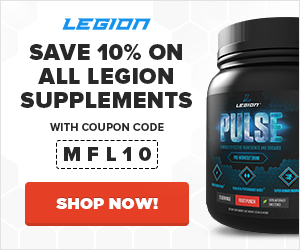 In case you’re not familiar with Kurtis, he’s the director of Research and Development for my supplement company Legion Athletics as well as the co-founder and former lead researcher and writer for Examine.com, which is the premiere online resource for science-based information on supplementation. Click the player below to listen now! 7:00 – What is your definition of a preworkout? 11:40 – What ingredients help and don’t help increase power output? 18:18 – How does Alpha-GPC work? 20:12 – How much Alpha-GPC do you need to take and when in order to see beneficial effects? 23:01 – How long before a workout should you take Alpha-GPC? 30:09 – What’s the best time to take creatine? 33:04 – What preworkout ingredients help with anaerobic exercise? 36:30 – What’s the effective dose of citrulline and when’s the best time to take it? 45:17 – What’s the effective dose of beta-alanine and when’s the best time to take it? 47:38 – What about betaine? 57:35 – Are there any other ingredients worth noting for aerobic or anaerobic training? 60:26 – How do you detect a bad preworkout supplement? 69:28 – Anything else you’d like to share?